We are currently consuming nature’s resources in a way that exceeds the natural limits of our planet. If we continue on this path, we will require the equivalent of two planet earths in the next few years, which is clearly unsustainable. Our food choices have a significant impact on the environment, contributing to 20-30% of total man-made greenhouse gas emissions (GHGe) – which are responsible for the accelerated global warming. Livestock farming is by far the biggest environmental burden accounting for 14.5% total man-made GHGe, uses up the majority of land, is the leading cause of deforestation, biodiversity loss, soil and water pollution and water use. We all have a crucial role to play including consumers, farmers, food companies as well as government. Production, consumption and less waste of more healthful plant foods is more resource efficient, produces less GHGe, helps to promote biodiversity and, in the main, promotes better health outcomes. Countries like Canada, Belgium, The Netherlands and the United Kingdom have renewed their food based dietary guidelines by fusing the latest understanding of nutrition and sustainability to bring about both ecological and health benefits. Their common starting point is the consumption of less animal proteins (in particular beef and red meat) and replacing it with more healthful plant food sources of protein such as soya and other beans and pulses, nuts and seeds. Other healthful plant foods alongside plant proteins should make up the majority of our diet: fruit, vegetables, starchy foods opting for whole grains wherever possible. The scientific community is also exploring the crossroads between health and sustainability. 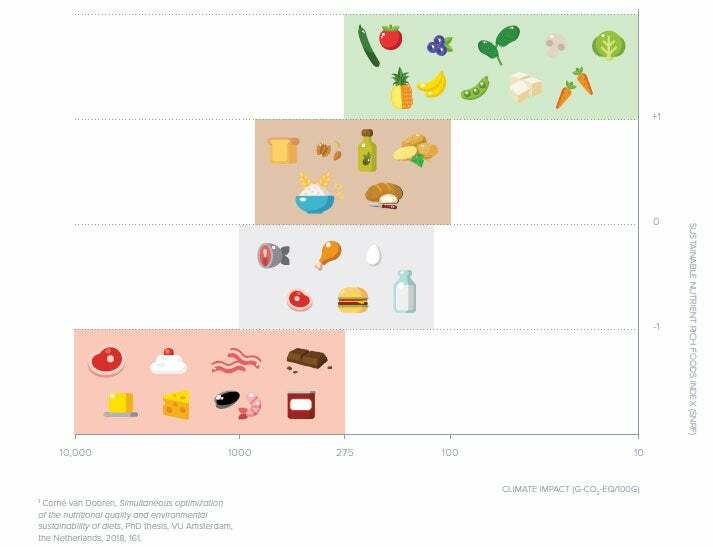 The Sustainable Nutrient Rich Foods index (SNRF) is a new measure which reflects both the climate and nutritional impact of food products. The SNRF index can assist in rating food products and can help consumers make their diets simultaneously more healthy and more sustainable!